An 18-year-old from Lawrence, Massachusetts was killed, and more than 10 others injured in a gas explosion on Thursday. Leonel Rondon, 18, of Lawrence, died after a chimney toppled by an exploding house crashed into his car. Andover Fire Chief Michael Mansfield said three people were injured in his town, including a firefighter. Lawrence General Hospital said it treated 13 people for injuries related to the gas explosions. One person was killed and more than 20 others injured in a series of fires and explosions north of Boston that authorities are blaming on over-pressurized natural gas lines. Lawrence General Hospital said 13 patients showed up for treatment following the gas explosions that occurred Thursday afternoon. Of those patients, two were critically injured. One was transferred to a Boston hospital for further treatment. Authorities said that patient, 18-year-old Leonel Rondon of Lawrence, was pronounced dead around 8:30 p.m. at Massachusetts General Hospital. He was reportedly inside a car at 35 Chickering Road in Lawrence when a chimney from a house explosion fell on the vehicle. Rondon, a musician who went by the name DJ Blaze, had just gotten his driver's license, grieving friends and relatives said. A teenager was killed and multiple people were injured across three communities in the Merrimack Valley region of Massachusetts on Thursday in a series of gas explosions. Andover Fire Chief Michael Mansfield said three people were injured in his town, including a firefighter. Their injuries were not believed to be life threatening. Hospital officials said some of those they were treating were not directly injured by the blasts but suffered health issues aggravated by the fires, like smoke inhalation. Lawrence General Hospital Chief of Emergency Medicine, Dr. George Kondylas, said the hospital tripled its emergency room staff after the incident. "This is what we train for. We drill for this, we plan for this, we go through exercising anticipating things like this happening hoping that it never does happen," he said. "But we have protocols in place where we're able to mobilize lots of extra personnel to do things like this including our trauma surgeons. But we train for disasters." He said the hospital hasn't seen any additional patients in some time, so they are hoping the worst is over. State police said they responded to 70 fires, explosions and investigations of gas odor in the communities of Lawrence, Andover and North Andover. Electricity was cut to residents in all three communities as crews work to prevent further damage. 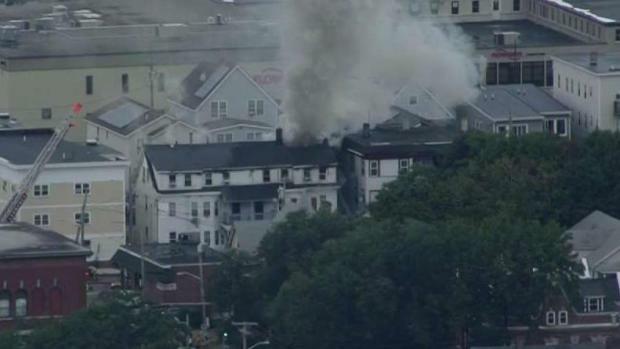 Two firefighters were among those injured in the gas explosions and fires Thursday in Merrimack Valley in Massachusetts. Officials in all three areas cancelled school on Friday, and courts and some state offices will also be shut down.